For some reason, "Fugazi" seems to be MARILLION's least appreciated studio album from the Fish-era. For sure, this second effort may be the most dated, due to the strong 80's production, but it remains a little gem of neo-progressive rock creativity. From now on, the band will gradually emancipate from their initial GENESIS influences: the songs will become shorter, more and more direct and will contain less long guitar or synthesizer soli, like on "Script For A Jester's Tear". However, the ideas and impetuosity are still present, and this opus features their hardest and most aggressive compositions from their Fish years. The sharp and incisive "Assassing" sounds typical of the eighties. This hard neo-prog song is very catchy while incorporating different ambiances and musical styles. A classic from MARILLION's! The rock-y "Punch and Judy" is also quite nice and energetic. In contrast, the soapy "Jigsaw" is more consensual, maybe a little commercial. The only true weak passage of the disc. Then comes the most progressive track of the record, the cool "Emerald Lies". This heavier song has some slight similitudes with ELOY's "Metromania", released the same year. With its organ and spacey keyboards, "She Chameleon" transports you to a fantasy land, alternating peaceful and darker moments. Very enchanting. In the same style of "Emerald Lies", "Incubus" is also pleasant. The dreamy finale is great. The title track is another highlight of the disc. It possesses both powerful punchy passages, fairytale and spacey moments. The finale hymn is in the style of "Forgotten Sons" from the previous album, and its Scottish ambiance is very dancing! Hearing so much variety and creativity in only 8 minutes is unfortunately too rare now, we want more! Although the music sounds very 80's, "Fugazi" contains very nice rocking tracks and displays a wide palette of musical styles. This last point proves that MARILLION cannot be reduced to a "sub-GENESIS from the eighties". Despite more direct compositions, the band is still audacious and manages to develop their own identity, spearheading the then nascent sub-genre. "Fugazi" is a good entry point to the band for hard rock fans. 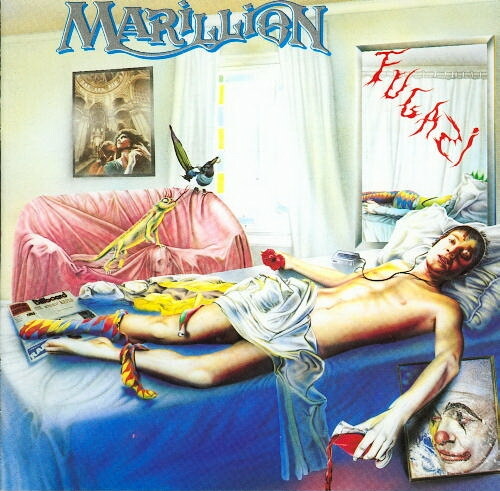 An underrated neo-progressive album, and one of the best MARILLION albums with ""Script For A Jester's Tear""!